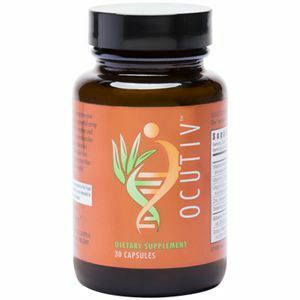 Ocutiv is the most complete health supplement for the eyes. It includes specific vitamins, minerals, antioxidants and powerful whole foods promoting optimal eye health. Ocutiv helps to fight oxidative damage to the eyes and helps to reduce eye discomfort and eye irritation. Vitamin A, vitamin C, vitamin E, zinc, selenium, bilberry, grape seed, certified organic blend whole foods, Certified Organic mineral complex, lutein, lycopene, zeaxanthin, astaxanthin, vegetable cellulose, microcrystalline cellulose, silica, magnesium stearate and water.